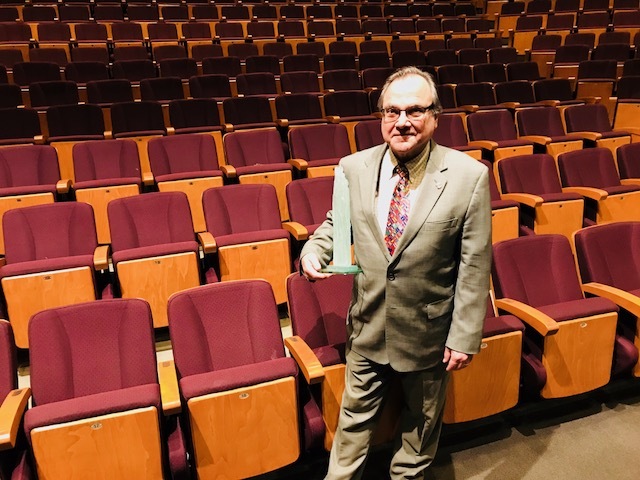 The Reif performing arts center president, David Marty, received the Larry Award at a ceremony in St. Paul, Tuesday, March 6 during the annual Arts Advocacy Day. The ten-year-old award goes to unsung heroes in the arts community who advocate behind the scenes to improve arts access to everyone across Minnesota. “A well-earned and distinguished acknowledgment of hard work and generous character,” said Pat and Alesso, Reif dance teacher. The Larry award is a glass sculpture by Minnesota sculptor Michael Tonder of Two Harbors, Minn. 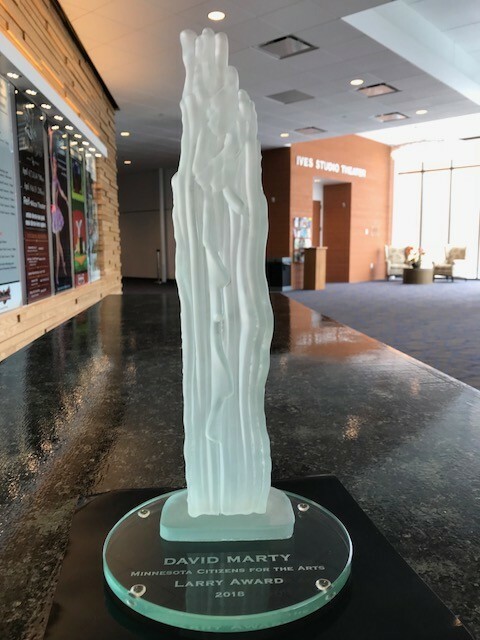 The brainchild of Minnesota Citizens for the Arts, The Larry is named for Lawrence Redmond, who has been the council’s lobbyist and unsung hero since the 1970s. Marty became the director of The Reif in November 1996, just 15 years after it was built and took production from a handful of shows to more than 50 top-notch national and international acts. In addition to expanding show offerings, Marty presided over a $10 million-plus expansion campaign, transforming The Reif into the stunning spectacle it is today. All very impressive, but for those who know him that isn’t the essence of why Marty deserves the Larry. Selfless passion for expanding the arts is his hallmark. Marty consistently reminds government and business leaders that a thriving arts community builds the economy and makes Northern Minnesota a destination for tourism for more than just outdoor activities. Marty plans to retire as The Reif president, July 1, 2018, but vows to stay involved and advocate for the Arts in Northern Minnesota and abroad.